PCI Data Acquisition continues to serve as a dominant form of test, measurement and control, through boards that plug into the PCI Bus. 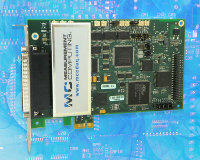 Firetail DAQ stocks a wide range of high quality, low cost PCI Data Acquisition boards sampling at various speeds in both analog IO and digital IO. Our products feature 8 to 64 analog channels with 12 and 16 bit resolution, and DIO boards of between 24 and 96 bits. No matter what your test and measurement specifications are, FiretailDAQ has a wide range of PCI Data Acquisition boards to fit your needs. Contact our team today to find out what PCI Data Acquisition device is the right one for your application. Click here to Contact.